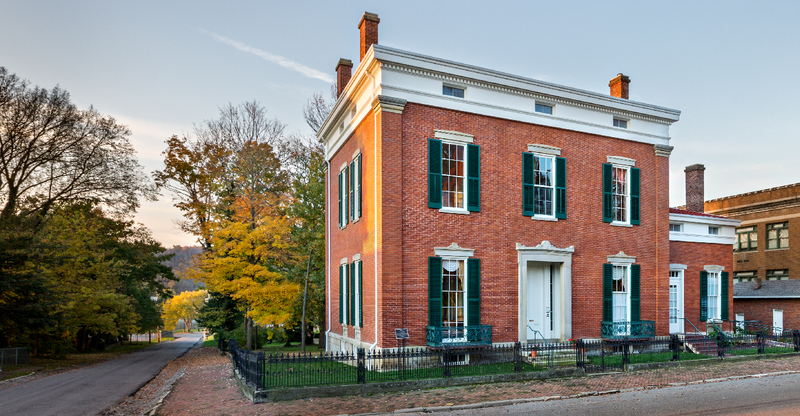 Upon its completion in 1849, Charles Shrewsbury’s Greek Revival-style home in Madison defined Antebellum elegance, with high-ceilinged rooms, decorative columns, and floor-to-ceiling windows framing views of the Ohio River. Architect Francis Costigan displayed his genius in the Shrewsbury home’s crowning feature: a freestanding spiral staircase ascending from the front foyer up through the entire height of the house. It was a showplace built for entertaining. In envisioning a new future for the Shrewsbury-Windle Home more than 150 years later, Historic Madison, Inc., decided to honor the role the home’s history as a gathering place by turning it into an events venue. 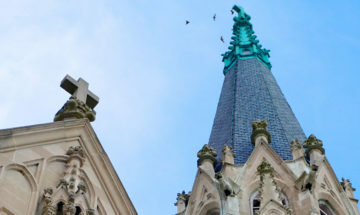 The group’s four-year transformation of the National Historic Landmark earned Indiana Landmarks’ 2019 Cook Cup for Outstanding Restoration, which we’ll present at our Rescue Party on April 27. 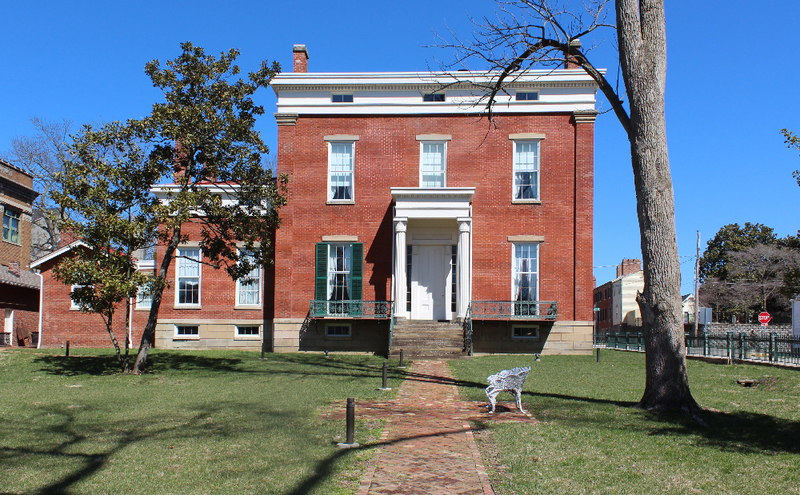 With street upon street of mid-nineteenth-century buildings, Madison boasts one of the largest National Historic Landmark districts in the nation. 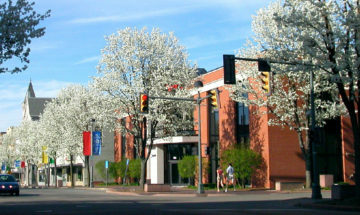 In the 1940s, Chicago residents John and Ann Windle became acquainted with the charming river town while visiting a relative who worked at nearby Hanover College. But it wasn’t until a real estate agent introduced them to the Shrewsbury House in 1948 that they decided to leave Chicago, buy the house, and begin restoring it for their home and antiques business. 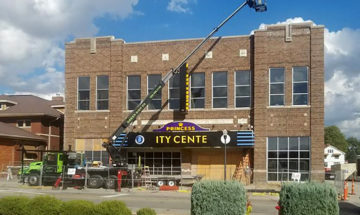 Over the ensuing decades, the Windles became a driving force for historic preservation, founding Historic Madison in 1960, and convincing locals and visitors to recognize the city’s architecture as its key economic asset. “The Windles had a way of getting people to fall in love with history by introducing them to a place with living history, rather than just a time capsule. They had this amazing house on the river where they’d invite you in, give you a drink, and let you see how wonderful it is,” says Chicago architect Paul Steinbrecher, a cousin of Ann’s. Historic Madison inherited the Shrewsbury-Windle House after Ann’s death in 2009. 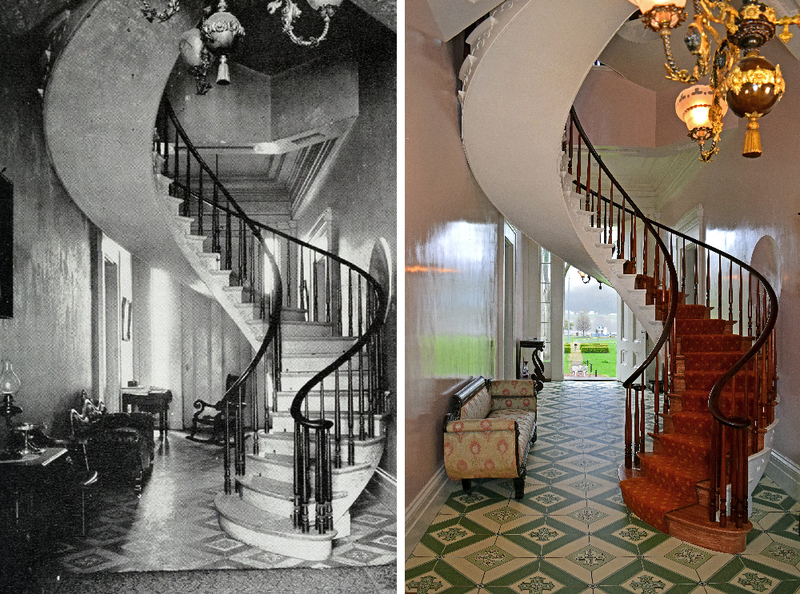 The house retained many of its original, character-defining features, including the stunning spiral staircase, original gasoliers, and even paint from the 1850s on the drawing room walls. However, a leaky roof and deferred maintenance had taken a toll. Only a portion of the house was heated, and air conditioning had never been installed—factors that limited the property’s public use. Working with Indianapolis-based RATIO Architects, Historic Madison developed a plan to address repairs and adapt the property to host meetings, receptions, and events. 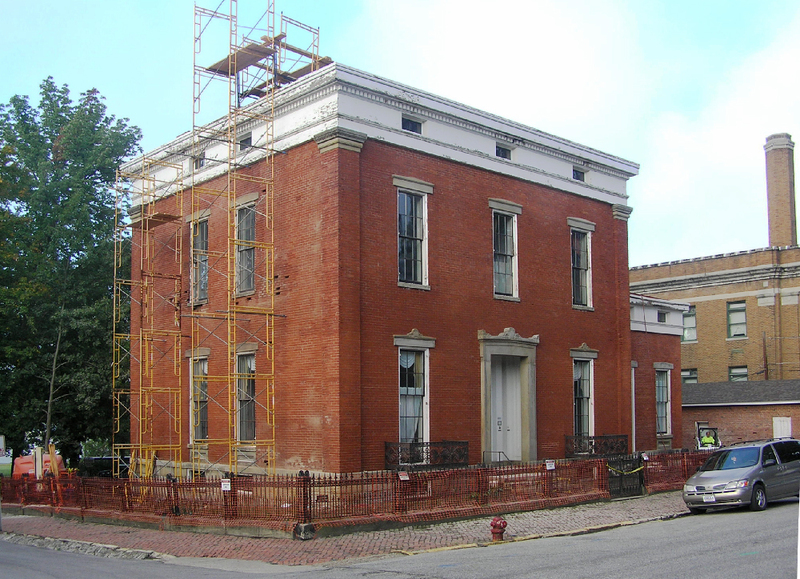 Outside, workers replaced the roof and fixed water issues, cleaned and repointed masonry, restored the home’s 1849 color scheme, and installed a sympathetic ramp to make the first floor accessible. 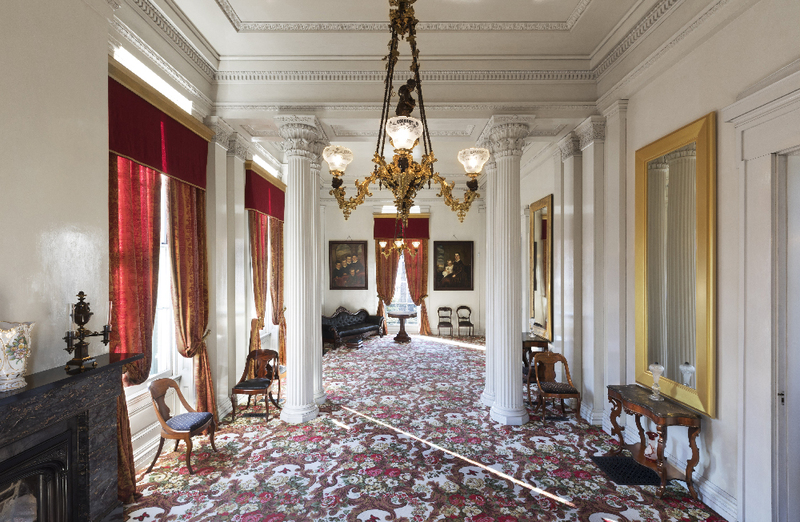 Inside, crews repaired plaster and used historic photographs to replicate the drawing room’s original carpet. Williamsport, Indiana-based Acanthus Arts conserved the c.1859 paint in the drawing room. A new catering kitchen and restrooms on the first floor support the home’s expanded use. Engineers faced a bigger challenge in figuring out how to add modern mechanical and lighting systems without marring the home’s historic appearance. High-efficiency heating and cooling units went into the basement and attic, with lines running through the back of closets and a non-working chimney. Electricians restored the original gas light fixtures, now fitted with LED lamps and an electronic control system since the home has no light switches. Aided by a $375,000 matching gift from the Jeffris Family Foundation, a $250,000 anonymous gift, a $50,000 grant from the Community Foundation of Madison & Jefferson County, $35,000 from the Jefferson County Historic Preservation Fund, and many individual donors, Historic Madison raised $2.2 million for the Shrewsbury-Windle House restoration. “The house has always been known as a gathering place for people interested in history, architecture, and antiques. What better way to honor the Shrewsburys and Windles than by continuing that tradition and doing the best restoration technology would allow?” says Historic Madison President and Executive Director John Staicer.